Hiiii! It’s Saturday morning, so this should be your brunch. Except it’s almost lunchtime now. 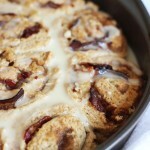 So maybe make this for Sunday morning breakfast instead! I know I am. I’m very habitual about foods sometimes. A few years ago, I ate sauteed spinach like 3x/day for about 5 months. I couldn’t get enough. I couldn’t stop! Then one day I just got over it and have hardly eaten spinach since. I went through the same phase with omelettes, and then most recently I’ve been eating French toast about twice/day. Although I’ve been making it with whole wheat bread, egg whites, and low sugar maple syrup, but still. That’s a lot of French toast, and it’s been a few months running now! I just go through food phases. Anybody with me on that? Since I’m already on a French toast kick, and I’d just made this incredible pumpkin banana bread (because nothing can be without pumpkin this time of year), it was the natural next step. I read in a magazine or something, yeeeeears ago, the idea to make French toast from quick breads. I thought it was *brilliant. * Because it is! It’s brilliant! I’d never considered it before that, but what a revolutionary concept! It’s fun, easy, different, and delicious. It’s pretty rich and heavy though, so it’s the kind of thing we save for weekends. We’re a quick bread household anyway. There’s almost always banana bread around. Chocolate zucchini bread is another staple. Now that it’s fall… hello, pumpkin bread! We love having quick breads on hand for fast breakfasts and snacks, but after you’ve made about 8,000 loaves, you do start to look for creative ways of using it up. This is one of those options! Let’s not lose sight of the fact that this is also a delicious bread! 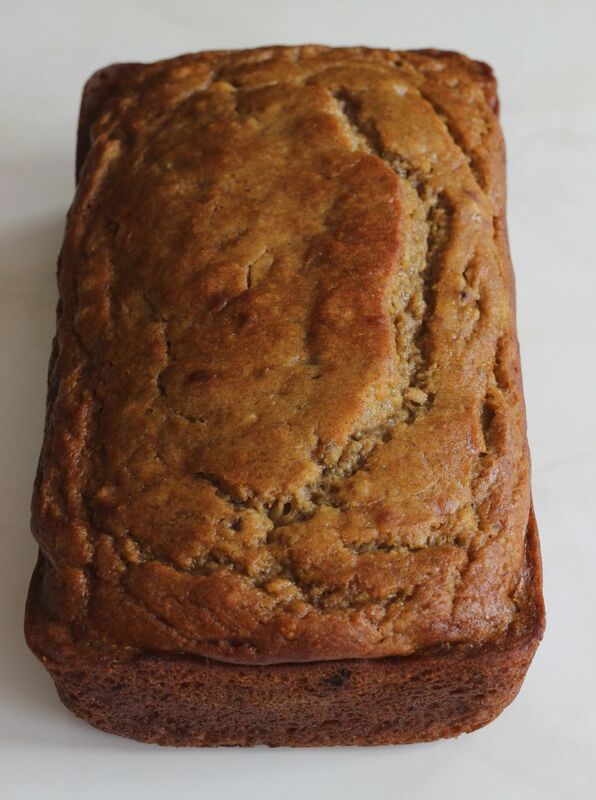 Pumpkin + banana bread. It had to happen. It’s dense, while still being fluffy and springy, and it’s a lovely balance of two flavors we all know and love. 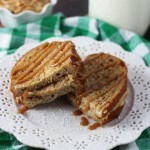 Just dunk it, grill it, give it a pat of butter, and douse it with maple syrup. The best French toast you’ve ever had! Homemade pumpkin banana bread is sliced and dunked into eggs, milk, and vanilla to make French toast! Topped with maple syrup! In a medium bowl, combine the flour, baking soda, baking powder, salt, and cinnamon; set aside. In a large mixing bowl, combine the brown sugar, oil, eggs, vanilla, and pumpkin. Add the dry ingredients to the sugar mixture alternately with the buttermilk, beating until just combined. Pour batter into a greased 9x5-inch loaf pan. Bake at 350 degrees for 55-65 min, or until a toothpick comes out clean. Allow to cool. Once bread cools, slice it into approximately 3/4-inch slices, or about 10-12 even slices. In a medium bowl, combine the whole eggs, egg whites, vanilla, cinnamon, and splash of milk. Dunk each side of the bread into the egg mixture, allowing a few seconds for it to soak in. In a large saucepan on medium heat, cook bread slices for 2-3 minutes on each side, or until lightly browned. 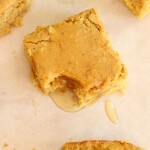 Serve with a pat of butter and a drizzle of maple syrup! Notice I’m always looking for a way to have dessert for breakfast? At it again. Also, you just watched butter melt. Yum! 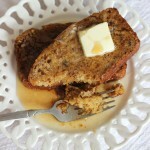 I love french toast, but I’ve never made it with banana bread, although I’ve seen that before! One of those things on my never ending list of recipes to try! 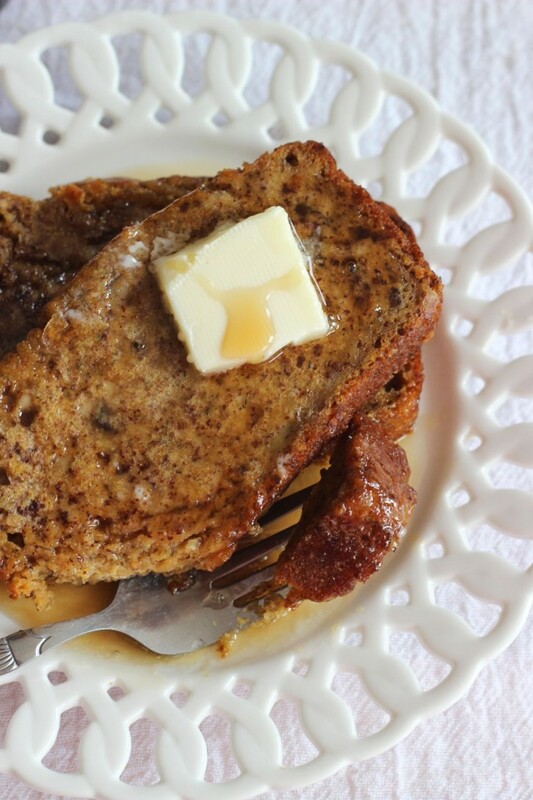 This looks like wonderful pumpkin banana bread and turning it into french toast is a great idea! Wow! Sounds like you love french toast to eat it twice a day! 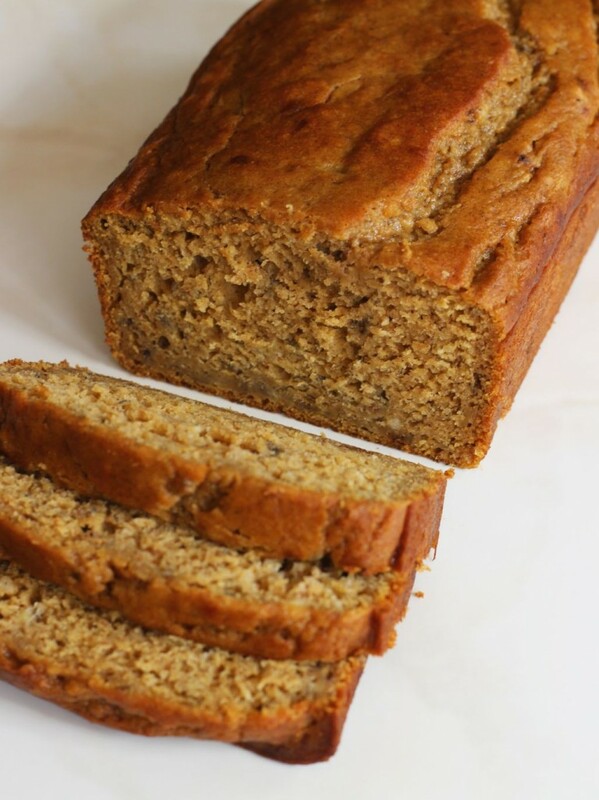 But I certainly don’t blame you, because this pumpkin banana bread version looks incredible! I’ve seen banana bread french toasts in restaurants, but sadly have never tried it before. Your recipe sounds delicious, Sarah! I love the pumpkin addition. So perfect for breakfast, brunch, dinner, or anywhere in between. Pinned! Yeah, I’ve been eating it twice a day lately, but I do that. I get in food phases where I eat the same things over and over for months, then don’t eat them again for like years. Haha. I do this a lot actually! Breakfast is my favorite meal so when I get hung up on a food, it’s usually a breakfast thing! 🙂 Hope you had a fabulous weekend, Gayle!! This is so delicious! I like banana bread, and make it quite often. I have never made french toast out of it, so that is definitely something new to try. 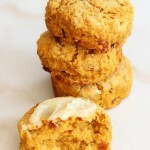 Btw, I stopped by from the Culinary Flavors blog, really liked your leaf cookies. I’m absolutely loving all your fall recipes! 🙂 I haven’t had french toast in years… how sad is that! This recipe is so awesome, I think I might just wake up extra early tomorrow to try it out! I LOVE french toast and I LOVE pumpkin and I would NEVER think to put those two together. These look to die for! Thanks for sharing the recipe. Can’t wait to try it. Thanks, Sharon! 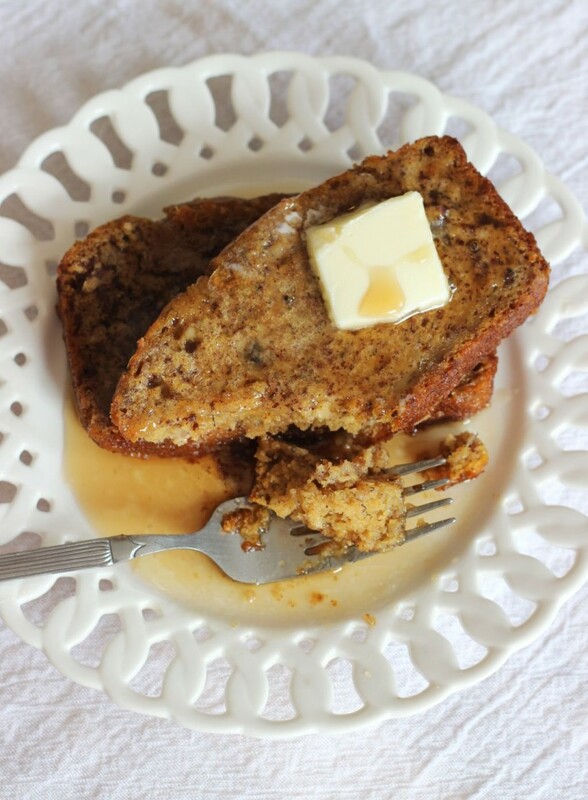 Yep, you could make French toast out of any quick bread really! Try it sometime! 🙂 Let me know if you do!! This looks amazing! I love the flavors you used! Thanks for linking up to Wonderful Wed. Blog Hop. 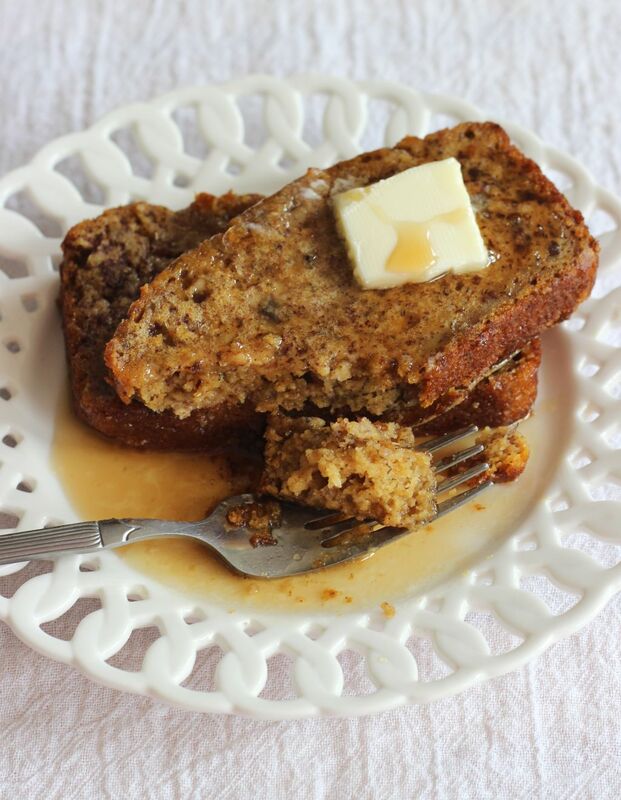 I Pinned your delicious banana bread to our Wonderful Wed. Blog Hop Banana Pinterest Board. I love your blog. Your pictures are beautiful. Can you tell me what plugin you use for leaving comments and the YES, add me to your mailing list. What a great idea? Wow! This looks amazing for a Saturday morning in the fall! I couldn’t imagine waking up to anything better this time of year! Thanks for sharing and thanks for joining the Celebrate Southern link up this week! I hope you have a great Halloween and that we see you back again for another week of the link up on Tuesday! I love this idea!! Thank you so much for linking up at Tasty Tuesday! Your recipe has been pinned to the Tasty Tuesday Pinterest board! Please join us again this week! Oh how delicious, I could eat this for brunch everyday! Thanks for linking up to Sweet and Savoury Sunday, stop by and link up again. Have a great day!! I just made the bread. I did not see the screen properly so I just realized that instead of 1/3 cup of oil I used 1/2… the bread is probably not as great as it should be but the taste is still good.